Bubonic plague, which is commonly referred to as plague, is a deadly infectious disease, which is caused by the bacterium Yersinia pestis. This bacterium, transmitted through the bite of a flea, has caused the death of millions of people. 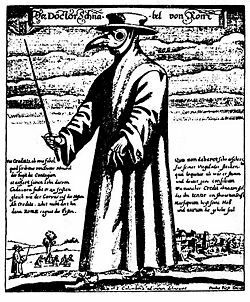 The epidemiological use of the term "plague" is currently applied to bacterial infections that cause buboes, although historically the medical use of the term plague has been applied to pandemic infections generally. A bubo is a swelling of the lymph nodes. A pandemic is an epidemic (an outbreak of an infectious disease) that spreads across a large region, such as a continent, or even worldwide). 6.2.1 Was the Black Death viral? Plague is primarily a disease of rodents. Infection of human beings most often occurs when a person is bitten by an infected flea that has fed on an infected rodent. The bacteria multiply inside the flea, sticking together to form a plug that blocks its stomach and causes it to begin to starve. The flea then voraciously bites a host and continues to feed, even though it is unable to satisfy its hunger. During the feeding process, blood cannot flow into the blocked stomach, and consequently the flea vomits blood tainted with the bacteria back into the bite wound. The Bubonic plague bacterium then infects a new host, and the flea eventually dies from starvation. Any serious outbreak of plague is usually started as a result of other disease outbreaks in rodents, or some other crash in the rodent population. During these outbreaks, infected fleas that have lost their normal hosts seek other sources of blood. In 1894, two bacteriologists, Alexandre Yersin and Shibasaburo Kitasato, independently isolated the bacterium in Hong Kong responsible for the Third Pandemic. Though both investigators reported their findings, a series of confusing and contradictory statements by Kitasato eventually led to the acceptance of Yersin as the primary discoverer of the organism. Yersin named it Pasteurella pestis in honor of the Pasteur Institute, where he worked. But in 1967, the genus was changed to Yersinia pestis, in honor of Yersin . Yersin also reported that rats were affected by plague bacteria not only during epidemics, but that they were also often affected preceding epidemics in humans. Villagers in China and India noticed that when large numbers of rats were found dead, plague outbreaks in people soon followed. In 1898, the French scientist Paul-Louis Simond, who had also come to China to battle the Third Pandemic, discovered the rat-flea vector relationship that drives the disease. He had noted that persons who became ill did not have to be in close contact with each other to acquire the disease. In Yunnan, China, inhabitants would flee from their homes as soon as they saw dead rats, and on the island of Formosa (Taiwan), residents considered handling dead rats a risk for developing plague. These observations led him to suspect that the flea might be an intermediary factor in the transmission of plague, since people acquired plague only if they were in contact with recently dead rats, but not affected if they touched rats that had been dead for more than 24 hours. In a now classic experiment, Simond demonstrated how a healthy rat died of plague after infected fleas had jumped to it from a plague-killed rat. There are three forms of plague : (1) bubonic, (2) septicemic, and (3) pneumonic. Bubonic plague becomes evident three to eight days after the infection. Initial symptoms are chills, fever, diarrhea, headaches, and the swelling of the infected lymph nodes as the bacteria replicate there. If untreated, the rate of mortality for bubonic plague is 50-90 percent (Hoffman 1980). In septicemic plague, there is bleeding into the skin and other organs, which creates black patches on the skin. There are bite-like bumps on the skin, commonly red and sometimes white in the center. Untreated septicemic plague is universally fatal, but early treatment with antibiotics reduces the mortality rate to between 4 and 15 percent (Wagle 1948; Meyer 1950; Datt Gupta 1948). People who die from this form of plague often die on the same day symptoms first appear. The pneumonic plague infects the lungs, and with that infection comes the possibility of person-to-person transmission through respiratory droplets. The incubation period for pneumonic plague is usually between two and four days, but can be as little as a few hours. The initial symptoms, of headache, weakness, and coughing with hemoptysis, are indistinguishable from other respiratory illnesses. Without diagnosis and treatment, the infection can be fatal in one to six days; mortality in untreated cases may be as high as 95 percent. There are 11 known species of Yersinia, but only three are considered pathogenic to human beings : (1) Y. pestis, the cause of plague, (2) Y. pseudotuberculosis, and (3) Y. enterocolitica, which is the most likely of these three to infect people. Yersinia pestis is a small gram-negative or bipolar-staining bacterium. They may appear as straight rods or coccobacilli. The bacteria have no flagella and are nonmotile. They contain two membranes. Organisms are best isolated from an infected bubo. Blood smears are usually negative for Y. pestis unless the patient is septicemic. However a series of blood samples taken 10-30 min apart has a greater chance of catching organisms released from lymph nodes into the blood. Sputum samples usually have too many other types of organisms to be useful (CDC 2007). 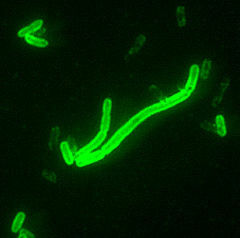 The plague bacilli are covered by a unique glycoprotein called the F1 antigen. This specific anitgen can be detected by a fluorescent antibody (FA) test. Plague bacilli can be broken open (lysed) by a specific bacteriophage at either 25 or 37 degrees Celsius. and the patient has no previous history of plague antigen (CDC 2007). An Indian doctor, Vladimir Havkin, was the first to invent and test a plague antibiotic. Doxycycline 100 mg (adults) or 2.2 mg/kg (children) orally twice daily have also been shown to be effective (Mwengee 2006). "Der Doktor Schnabel von Rom" (English: "Doctor Beak of Rome") engraving by Paul Fürst (after J Columbina). The beak is a primitive gas mask, stuffed with substances (such as spices and herbs) thought to ward off the plague. The earliest (though unvalidated) account describing a possible plague epidemic is found in I Samuel 5:6 of the Hebrew Bible (Torah). In this account, the Philistines of Ashdod were stricken with a plague for the crime of stealing the Ark of the Covenant from the Children of Israel. These events have been dated to approximately the second half of the eleventh century B.C.E. The word "tumors" is used in most English translations to describe the sores that came upon the Philistines. The Hebrew, however, can be interpreted as "swelling in the secret parts." The account indicates that the Philistine city and its political territory were stricken with a "ravaging of mice" and a plague, bringing death to a large segment of the population. In the second year of the Peloponnesian War (430 B.C.E. ), Thucydides described an epidemic disease that was said to have begun in Ethiopia, pass through Egypt and Libya, then come to the Greek world. In the Plague of Athens, the city lost possibly one third of its population, including Pericles. Modern historians disagree on whether the plague was a critical factor in the loss of the war. This epidemic has long been considered an outbreak of plague; however, because of Thucydides' description, modern scholars dispute that it was indeed plague. Many modern scholars feel that typhus, smallpox, or measles may better fit the descriptions. A recent study of the DNA found in the dental pulp of plague victims suggests that typhoid was actually responsible. Other scientists dispute these findings, citing serious methodologic flaws in the DNA study. The Plague of Justinian in 541–542 C.E.is the first known pandemic on record and marks the first firmly recorded pattern of bubonic plague. This outbreak is thought to have originated in Ethiopia or Egypt. The huge city of Constantinople imported massive amounts of grain, mostly from Egypt, to feed its citizens. The grain ships may have been the source of contagion for the city, with massive public granaries nurturing the rat and flea population. At its peak, the plague was killing 10,000 people in Constantinople every day and ultimately destroyed perhaps 40 percent of the city's inhabitants. It went on to destroy up to a quarter of the human population of the eastern Mediterranean. In 588 C.E., a second major wave of plague spread through the Mediterranean into what is now France. A maximum of 25 million dead is considered a reasonable estimate. An outbreak of it in the 560s C.E. was described in 790 C.E. as causing "swellings in the glands…in the manner of a nut or date" in the groin "and in other rather delicate places followed by an unbearable fever." While the swellings in this description have been identified by some as buboes, there is some contention as to whether the pandemic should be attributed to the bubonic plague organism, Yersinia pestis. During the mid-fourteenth century, from about 1347 to 1350, the Black Death, a massive and deadly pandemic, swept through Eurasia, killing approximately one third of the population (according to some estimates) and changing the course of Asian and European history. It is estimated that anywhere from a quarter to two-thirds of Europe's population became victims to the plague, making the Black Death the largest death toll from any known non-viral epidemic. While accurate statistical data do not exist, it is estimated that 1/4 of England's population (4.2 million) died. A higher percentage of individuals is likely to have died in Italy. On the other hand, northeastern Germany, Bohemia, Poland, and Hungary are believed to have suffered less, with no estimates for Russia or the Balkans. In many European cities and countries, the presence of Jews was blamed for the arrival of the plague, and they were killed in pogroms or expelled. The Black Death continued to strike parts of Europe throughout the fourteenth, fifteenth, and sixteenth centuries with intensity and fatality decreasing with time, strongly suggesting rising resistance. Some have argued that changes in hygiene habits and strong efforts within the public health and sanitation sectors had a significant impact on the rate of infection. Also, medical practices of the time were based largely on spiritual and astrological factors, but towards the end of the plague, doctors took a more scientific approach to helping patients. Was the Black Death viral? In the early twentieth century, following the identification by Yersin and Kitasato of the plague bacterium that caused the late nineteenth and early twentieth century Asian bubonic plague (the Third Pandemic), most scientists and historians came to believe that the Black Death was an incidence of this plague, with a strong presence of the more contagious pneumonic and septicemic varieties increasing the pace of infection, spreading the disease deep into inland areas of the continents. It was claimed that the disease was spread mainly by black rats in Asia and that therefore there must have been black rats in northwest Europe at the time of the Black Death to spread it, although black rats are currently rare, except near the Mediterranean. This led to the development of a theory that brown rats had invaded Europe, largely wiping out black rats, bringing the plagues to an end, although there is no evidence for this theory in historical records. The view that the Black Death was caused by Yersinia pestis has been incorporated into medical textbooks throughout the twentieth century and has become part of popular culture, as illustrated by recent books (Kelly 2005). The cycles and trends of infection were very different between the diseases—humans did not develop resistance to the modern disease, but resistance to the Black Death rose sharply, so that eventually it became mainly a childhood disease. Cohn also points out that while the identification of the disease as having buboes relies on accounts of Boccaccio and others, they described buboes, abscesses, rashes, and carbuncles occurring all over the body, mostly concentrated around the neck or behind the ears. In contrast, the modern disease rarely has more than one bubo, most commonly in the groin, and is not characterized by abscesses, rashes, and carbuncles. The Third Pandemic began in China in 1855, spreading plague to all inhabited continents and ultimately killing more than 12 million people in India and China alone. Casualty patterns indicate that waves of this pandemic may have come from two different sources. The first was primarily bubonic and was carried around the world through ocean-going trade, transporting infected persons, rats, and cargoes harboring fleas. The second, more virulent strain was primarily pneumonic in character, with a strong person-to-person contagion. This strain was largely confined to Manchuria and Mongolia. Researchers during the "Third Pandemic" identified plague vectors and the plague bacterium, leading, in time, to modern treatment methods. The last significant European outbreak of plague occurred in Russia in 1877–1889 C.E. in rural areas near the Ural Mountains and the Caspian Sea. Efforts in hygiene and patient isolation reduced the spread of the disease, with approximately 420 deaths in the region. Significantly, the region of Vetlianka is near a population of the bobak marmot, a small rodent, which may be a very dangerous plague reservoir. The bubonic plague continued to circulate through different ports globally for the next 50 years. However, it was primarily found in Southeast Asia. An epidemic in Hong Kong in 1894 had particularly high death rates, greater than 75 percent. As late as 1897, medical authorities in the European powers organized a conference in Venice, seeking ways to keep the plague out of Europe. The disease reached the Republic of Hawaii in December of 1899, and in an unprecedented catastrophe, the Board of Health of Hawaii burned down all of Honolulu’s Chinatown on January 20, 1900. Plague finally reached the United States later that year, in San Francisco. Although the outbreak that began in China in 1855 is conventionally known as the Third Pandemic—the First being the Plague of Justinian and the second being the Black Death—it is unclear whether there have been fewer, or more, than three major outbreaks of bubonic plague. Most modern outbreaks of bubonic plague among humans have been preceded by a striking, high mortality among rats, yet this phenomenon is absent from descriptions of some earlier plagues, especially the Black Death. The buboes, or swellings of lymph nodes in the groin, that are especially characteristic of plague, are also a feature of other diseases such as syphilis and gonorrhea. Plague has a long history as a biological weapon. Historical accounts from medieval Europe detail the use of infected animal carcasses of cattle, horses, and human beings, by Mongols, Turks, and other groups, to contaminate enemy water supplies. Plague victims were also reported to have been tossed by catapult into cities under siege. During World War II, the Imperial Japanese Army developed weaponized plague, based on the breeding and release of large numbers of fleas. During the Japanese occupation of Manchuria, Unit 731 deliberately infected Chinese civilians and prisoners of war with plague bacteria. These subjects, called "logs," were then studied by dissection, or vivisection while still conscious. Kirby (2005), who notes that "plague fleas have a rich military heritage as vectors of disease," records an effort by Japan to use a weapon of plague fleas against the United States in the Pacific theater in 1944, which apparently was foiled by the sinking of a submarine. Fortunately, after considering to use such weapons of devastating destructiveness against the continental United States, the Chief of Staff of the Imperial Japanese Army canceled the mission in March of 1945, considering it to be ethically unacceptable (Kirby 2005). Germany and the USSR investigated means of using fleas to transmit bubonic plague beginning in the 1930s, and the United States after the Korean War (Kirby 2005). After World War II, both the United States and the Soviet Union developed diverse means of weaponizing pneumonic plague. Experiments included various delivery methods, vacuum drying, sizing the bacteria, developing strains resistant to antibiotics, combining the bacteria with other diseases (such as diphtheria), and genetic engineering. Scientists who worked in USSR bio-weapons programs have stated that the Soviet effort was formidable and that large stocks of weaponized plague bacteria were produced. Information on many of the Soviet projects is largely unavailable. Aerosolized pneumonic plague remains the most significant threat. Two species of non-plague Yersinia, Yersinia pseudotuberculosis and Yersinia enterocolitica, still exist in fruit and vegetables from the Caucasus Mountains east across southern and central Russia, to Kazakhstan, Mongolia, and parts of China; in Southwest and Southeast Asia, Southern Africa and East Africa (including the island of Madagascar); in North America, from the Pacific ocean eastward to the western Great Plains, and from British Columbia south to Mexico; and in South America in two areas: The Andes mountains and Brazil. There is no plague-infected animal population in Europe or Australia. Worldwide there are about 1,000 to 2,000 cases of human infection by plague each year. The last plague epidemic involving rats in the United States occurred in Los Angeles in 1924-25. In the 1980s there were about 18 cases of plague per year with most of the victims being less than 20 years old. On 19 April, 2006, CNN News and others reported a case of plague in Los Angeles, California, the first reported case in that city since 1984. In May 2005, KSL Newsradio reported a case of plague found in dead field mice and chipmunks at Natural Bridges about 40 miles west of Blanding in San Juan County, Utah. In June 2006, the Arizona Central reported an article from the Associated Press of a case of plague found in a cat. In the U.S., about half of all food cases of plague since 1970 have occurred in New Mexico. There were 6 plague deaths in the state in 2006, the first fatalities in 12 years. The British Broadcast Corporation (BBC) reported that one hundred deaths resulting from pneumonic plague were reported in Ituri district of the eastern Democratic Republic of the Congo in June 2006. Control of the plague was proving difficult due to the Ituri conflict. ABC News. 2005. Plague-infected mice missing From N.J. lab. ABC News September 15, 2005. Retrieved May 8, 2007. Arizona Central. 2006. Cat tests positive for bubonic plague. Arizona Central June 28, 2006. Retrieved May 8, 2007. BBC News. 2006. DR Congo 'Plague' leaves 100 dead. BBC News June 14, 2006. Retrieved December 15, 2006. Centers for Disease Control (CDC). 2005. Plague. Centers for Disease Control. Retrieved April 14, 2007. Datt Gupta, A. K. 1948. A short note on plague cases treated at Campbell Hospital. Ind Med Gaz 83: 150–151. Hoffman, S. L. 1980. Plague in the United States: The "Black Death" is still alive. Annals of Emergency Medicine 9: 319–22. Kirby, R. 2005. Using the flea as weapon. Army Chemical Review July-December (2005): 30-35. Meyer,K.F. 1950. Modern therapy of plague. J Am Med Assoc 144: 982–985. Mwengee, W. et al. 2006. Treatment of plague with genamicin or doxycycline in a randomized clinical trial in Tanzania. Clin. Infect. Dis. 42(5): 614–21. New Mexico Department of Health, Albuquerque Environmental Health Department. 2006. Department of Health confirms sixth human plague case. Fifth case from Torrance County dies. New Mexico Department of Health July 25, 2006. Retrieved May 8, 2007. Patrick, A. 1967. Disease in antiquity: Ancient Greece and Rome. In D. Brothwell and A. t. Sandison, eds., Diseases in Antiquity. Springfield, Illinois. Simpson, W. J. 1905.A Treatise on Plague. Cambridge, England: Cambridge University Press. Wagle, P. M. 1948. Recent advances in the treatment of bubonic plague. Indian J Med Sci 2: 489–94. Biraben, J.-N. 1975. Les Hommes et la Peste The Hague. de Carvalho, R. W., N. M. Serra-Freire, P. M. Linardi, A. B. de Almeida, and J. N. da Costa. 2001. Small rodents fleas from the bubonic plague focus located in the Serra dos Órgãos Mountain Range, State of Rio de Janeiro, Brazil. Memórias do Instituto Oswaldo Cruz 96(5): 603–609. Retrieved March 2, 2005. Epidemic and Pandemic Alert and Response: Plague. This page was last modified on 7 July 2016, at 15:41.